Its time to start tapping the trees for Maple syrup. A few months ago Sonny and our daughter-in-law Clarissa, trekked around the property and marked the maple trees while they still had leaves to identify them. We aren’t tree savvy enough yet to know what they are just by looking at the bark, but we are learning. The best trees and the first to start running sap are the sugar maples, then the red maple and silver maples will begin to flow. The sap from Sycamore trees can be used too, but it takes about 90 gallons of sap to make one gallon of syrup as opposed to about 40 gallons of maple sap to make one gallon. Suffice it to say we won’t be tapping any Sycamore trees and we don’t really need to as we have plenty of Maples. 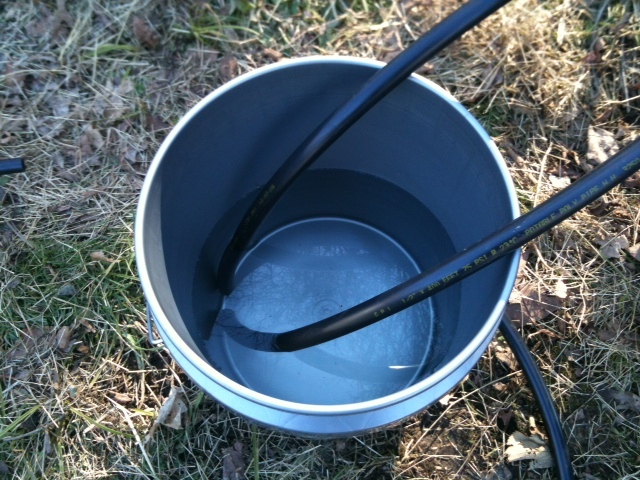 The sap usually runs for about a month and a half in our area. You know its time to tap the trees when the night temps get down to the 20’s and 30’s and then warm up into the 40’s and 50’s during the day. Lynn from TwoLynn’s Farm came by Friday to give Sonny some instruction on how to tap the trees. You want to tap your trees on the south side. A hand drill or power drill on low can be used to drill the hole. When using a power drill you don’t want to drill too fast because that burns the sap as it first seeps out and the tree tries to heal itself by crystalizing the sugar and blocking the hole. To drill the hole you need to use a 7/16th drill bit and drill at a slight up angle, so that when the tap is placed the sap can flow in a downward direction into the attached hoses and into the bucket. Some people just attach a bucket directly to the tap. That method is fine when your land is flat or slightly inclined but when your trees are on a steep hillside its easier run hoses down into buckets. The buckets need to be checked a couple times of day and be switched out if full. Sonny and Sugar Maple we almost cut down. We took about 13 gallons of sap to TwoLynn’s farm yesterday which is not that much in the scheme of things, but it came from just three trees. Sonny has tapped more trees this afternoon and we should be able to acquire an ample supply of sap. We have a deal with TwoLynn’s Farm where they will process our sap and we will get half of the syrup product back. We won’t get a lot of syrup this year, but it will be enough to share with family and give us an idea as to whether or not this is a good endeavor for Pot Hole Farm. If it is we may invest in a sugar shack of our own, but the equipment is quite costly. I just want to mention that the first tree we tapped was an ancient sugar maple that sits on the right side of our house. We almost cut it down last year because it looked like it needed to be. We put four taps into that tree and it filled our first bucket. Large Maples that look like trees from a horror film can have up to four taps placed into them. 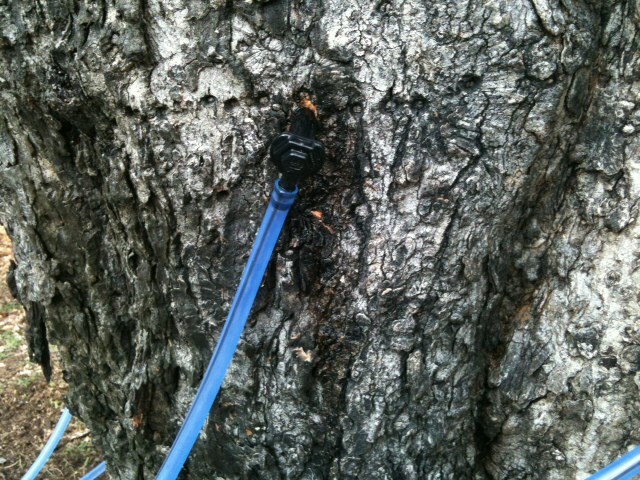 Tapping the trees does not harm them and they can continue to be tapped for decades. This is another new experience for us here at PHF and as always we are grateful to TwoLynn’s Farm for showing us the ropes. Note: We have tapped about twenty trees so far and we just checked the buckets. 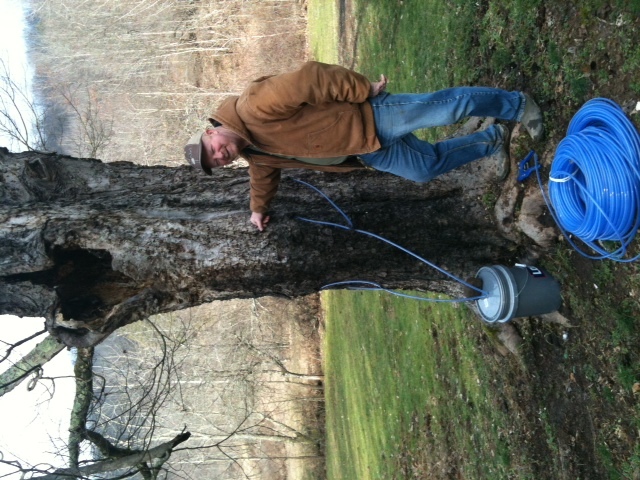 We now have 15 gallons of sap. More trees will have to be tapped. This entry was posted on Monday, February 20th, 2012 at 5:09 pm and is filed under Off-Grid. You can follow any responses to this entry through the RSS 2.0 feed. You can leave a response, or trackback from your own site.